Assesses both verbal an nonverbal intelligence. Verbal intelligence is assessed by measuring verbal problem solving and verbal reasoning, which uses acquired knowledge and skills. Nonverbal intelligence is assessed by measuring reasoning and spatial ability using novel situations and stimuli. Informs decisions in classification, selection, and educational placement. 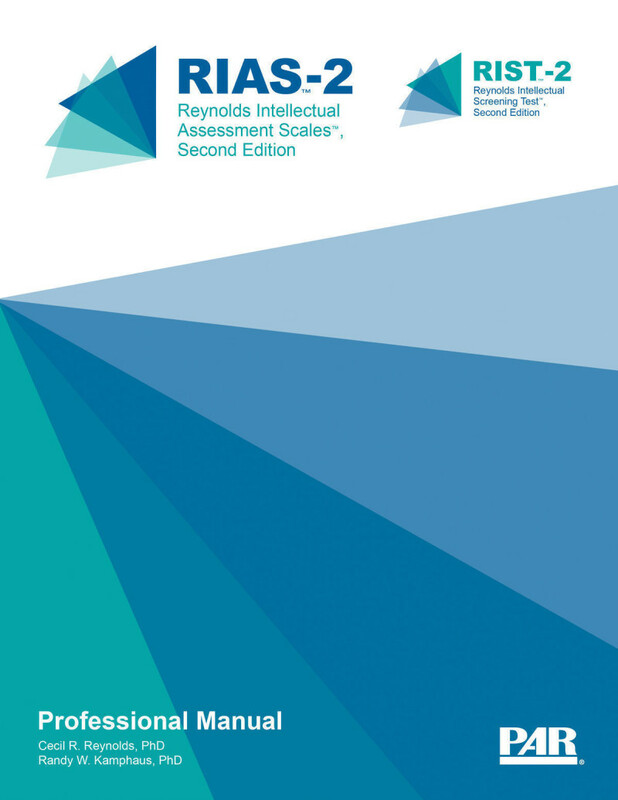 The RIAS-2 is ideal as a stand-alone intellectual assessment or as part of a clinical battery, when a standardised assessment of intellectual functioning is needed to diagnose specific disorders such as intellectual disabilities or learning disabilities, and for educational placement. Data were gathered from the following 12 clinical groups: stroke, dementia, hearing impaired, intellectual disability disorder (child and adult), TBI (child and adult), learning disabilities (child and adult), ADHD (child and adult), and gifted. Percentile ranks, 90% and 95% confidence intervals, T scores, z scores, NCEs, and stanines are available. Internal consistency studies associated with RIAS-2 indexes exceed .90 across age groups. RIAS-2 indexes correlated highly with RIAS indexes, providing support for the consistency of item content and performance between the original measure and this revision. Criterion-related validity was assessed by examining correlations between the RIAS-2 indexes and the WISC-IV™, WAIS-IV™, WPPSI-IV™, AAB, FAR, and ChAMP. All correlations were found to be in the strong to very strong range. Percentile ranks, 90% and 95% confidence intervals, T scores, Z scores, NCEs, and stanines are available - Internal consistency studies associated with RIAS-2 indexes exceed .90 across age groups. Normative data are based on a sample of 2,154 individuals ages 3-94 years, representing 2012 U.S. Census proportions for age, gender, geographic region, ethnicity, and years of education.